Laid down by Seattle Tacoma Shipbuilding. June 30 1942. Launched July 4 1943 and commissioned December 18 1943. Fate Sunk by Japanese Kamikaze Aircraft off Okinawa May 4 1945. 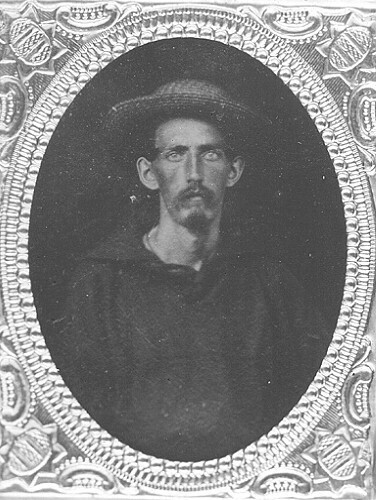 152 of her crew were lost with the ship and remain on duty. "For extremely meritorious service during Salvage Operations after the U.S.S. PRINCETON had been critically damaged by enemy Japanese action in the Battle off Samar, October 24, 1944. Undeterred by foul weather, fires raging on the flight and hanger decks of the stricken carrier and a series of violent internal explosions, the U.S.S. MORRISON gallantly went alongside. 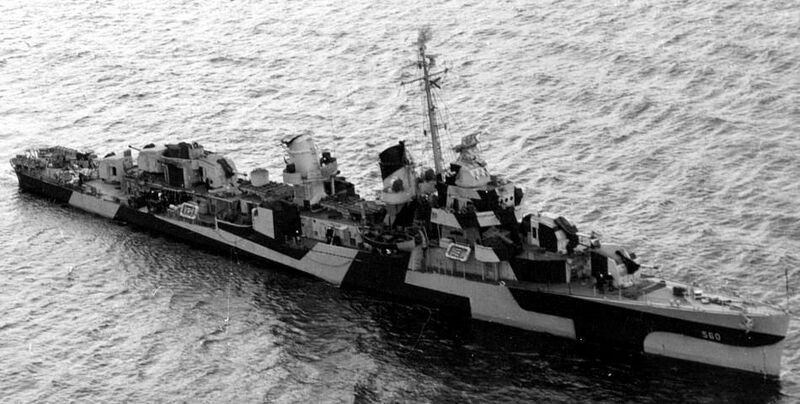 Becoming wedged between the stacks of the PRINCETON as the wind steadily rose and rain reduced visibility, the MORRISON rode in irons for almost an hour and, with heavy debris falling on her decks and communications handled by word of mouth, efficiently rigged hoses and aided fire fighting parties, standing by the carrier until fires were under control. 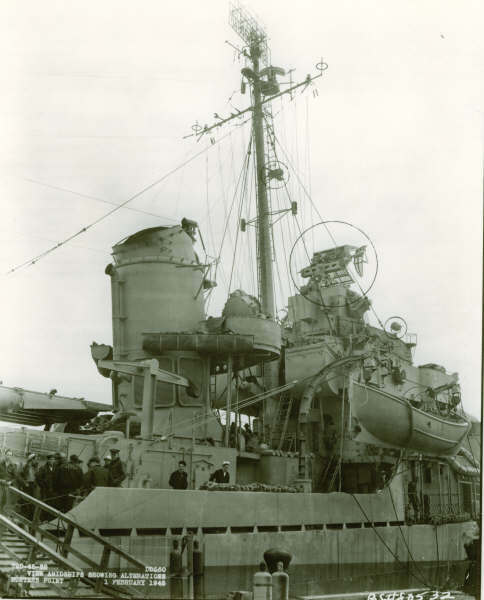 Later, when a terrific explosion blew off the major portion of the PRINCETON's stern she immediately dispatched boats to assist in the rescue of survivors and recovered almost 400 men from the sea. 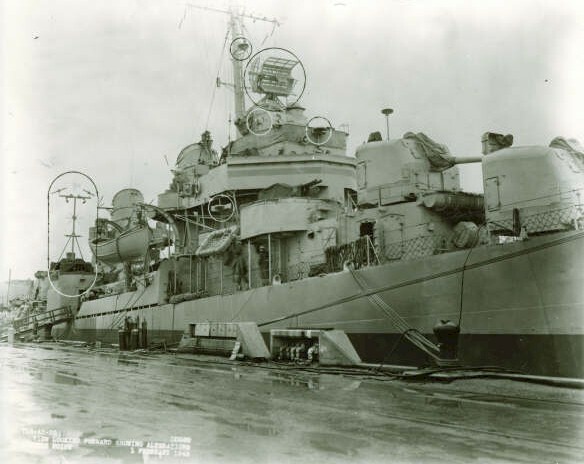 Her high standards of loyalty and service as evidenced by the self-sacrificing devoted duty of her officers and men reflect the highest credit upon the MORRISON and the United States Naval Service." All personnel attached to and serving on board the U.S.S. 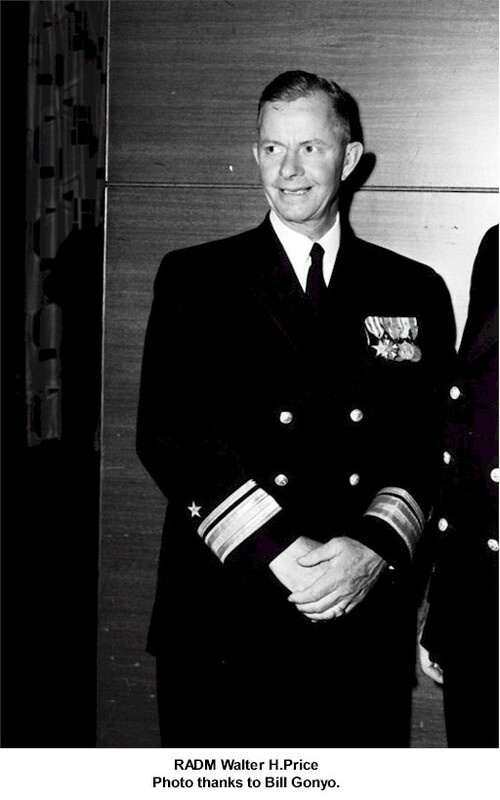 MORRISON on October 24, 1944, are authorized to wear the NAVY UNIT COMMENDATION Ribbon. "For outstanding heroism in action as a Fighter Direction Ship on Radar Picket duty at Okinawa, May 4, 1945. Promptly opening fire on a group of more than forty Japanese planes which penetrated our aircraft screen to attack the ships of the radar picket station, the U.S.S. MORRISON skillfully fought off the determined attackers for over an hour and, with her own gunfire, shot down five aircraft before they could complete suicide dives. Maintaining a steady barrage against the overwhelming force, she gallantly continued in action despite severe damage from four suicide planes which struck her in rapid successions, fighting resolutely until she went down shortly after the last hit. 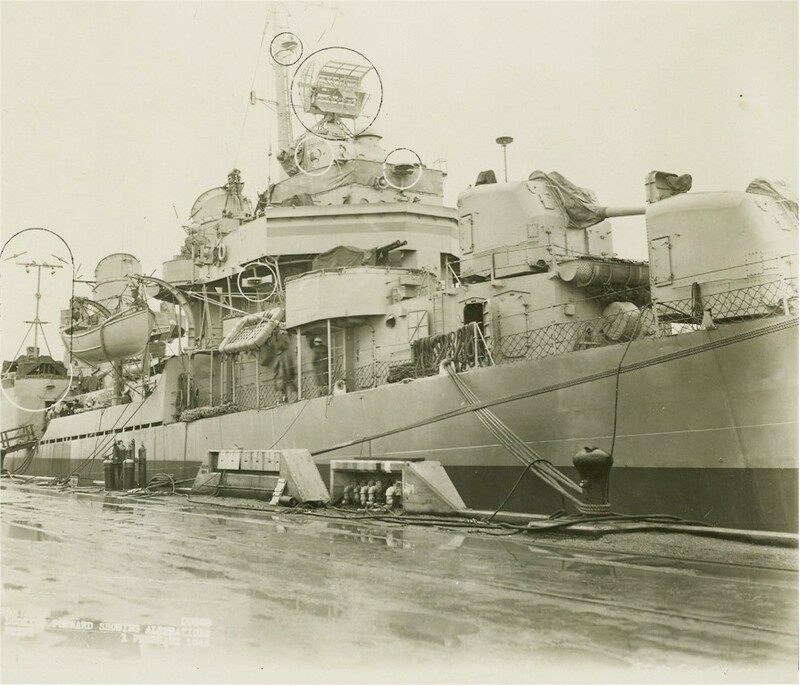 Her sturdy and valiant service under a prolonged suicide bombing attack contributed to the effective defense of our ships and reflects the highest credit upon the MORRISON, her courageous officers and men and the United States Naval Service"
All personnel attached to and serving on board the U.S.S. 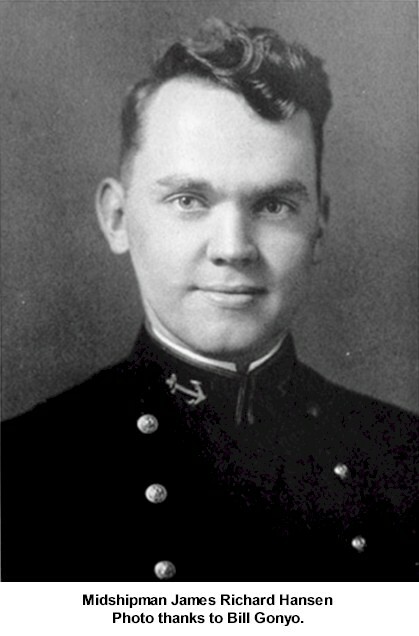 MORRISON on May 4, 1945 are authorized to wear the NAVY UNIT COMMENDATION Ribbon. 100k Off Point No Point, Washington, 24 February 1944. She was performing RDF calibration as part of her post-shakedown trials. The ship is painted in Camouflage Measure 32/13d. 110k As viewed from Gambier Bay (CVE 73), 24 July 1944. 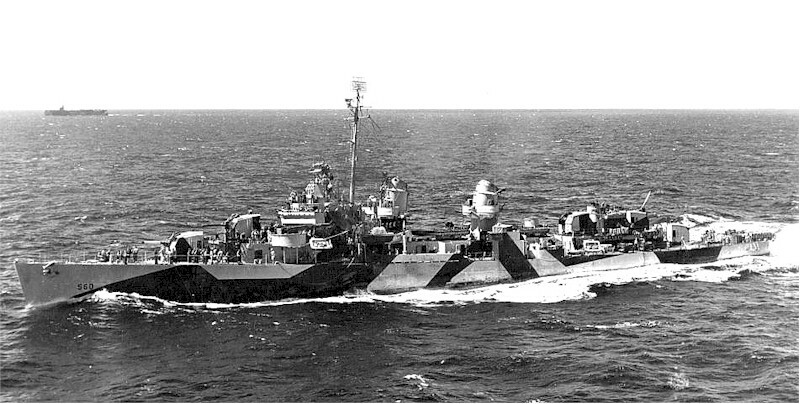 On this date Morrison was operating as a A/S screening unit of TU 52.14.1, operating east of Saipan. The ship is painted in camouflage Measure 32, Design 13d.